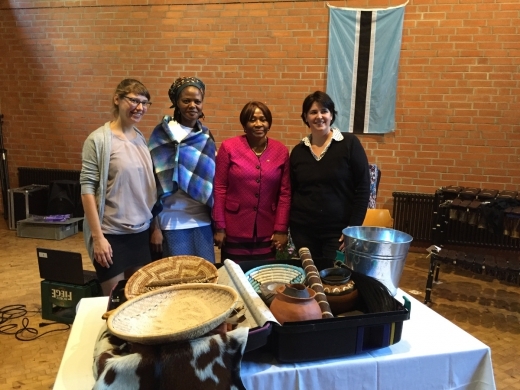 The Embassy participated in an event where Batswana in Witten presented a Suitcase full of Botswana cultural items to Caritas, a non-governmental organization. The event themed “Country in a Suitcase” is a joint project by Caritas and the Red Cross where nationals of different countries are given an opportunity to present their cultures in a suitcase. Batswana in Witten and the surrounding areas led by Michael Lebang filled up the suitcase with items such as Mothubane (a 3 legged pot), loselo, lohetlho, tlatlana, wooden spoon, phate, seditsi, animal bell, nkgo, sego just to name a few. The items were presented as if it’s Dikgafela (traditional harvest festival) as men, women and children sang and danced to the Botswana traditional songs. This suitcase will be kept by Caritas and it will be borrowed by schools and other organizations who wants to learn more about Botswana, and during those times Ms Lebang will accompany the suitcase in order to explain its contents and how they are used in Botswana. She will also be entrusted in making sure that the contents are kept properly.